Given the evidence that it has shrunk – a very wide seam between it and the next transom plank above, I fully expected to release the bottom transom plank. However, the prospect of first stripping bottom paint lying on my back and then releasing all the fasteners driven through the tails of the bottom planks and into the bottom transom plank was foreboding at best. And it was and is. 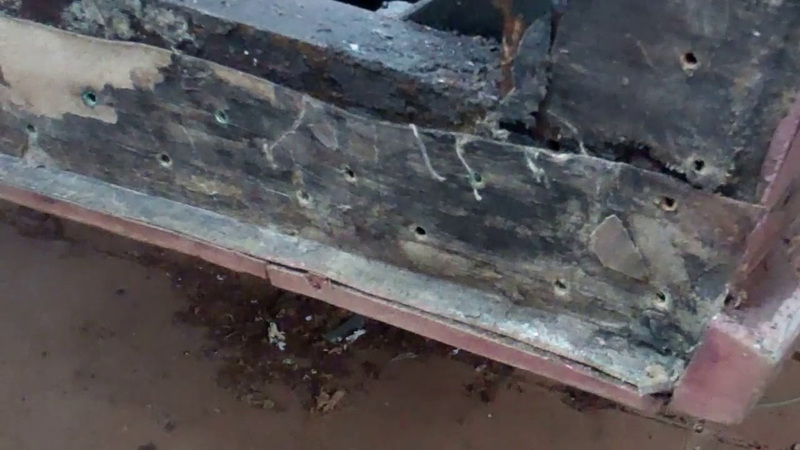 We now know that Chris-Craft moved the final course of fasteners forward from the tails, just enough that they are driven into the transom frame’s bottom bow. The attempt to waterproof the seam along the bottom edge of the bottom plank was attempted using the oil-permeated canvas we have all seen when releasing bottom planking. Suffice it to say that, like the stuff under bottom planking, this course of canvas had long since lost whatever waterproofing qualities it had in 1959. When the time comes we will install the bottom plank bedded in copious amounts of mahogany 3M5200. A combination of finding green, and therefore moisture adulterated, fasteners behind the test bungs I popped, and a ubiquitous design issue that translates into a chronic, although slow leak, we also released the next transom plank. The issue occurs at both ends of that plank, from its bottom edge up about 2 inches. Chris-Craft originally sealed the seam between this plank and the transom frame member it lands on using the same sealer-impregnated canvas technique. However, each of the first 3 1954-1959 17’ Sportsman models we have preserved to date tended to seep water through that joint until we bedded them in 3M5200. Proving that even old boat guys can learn, we routinely release this plank, remove what is left of the canvas and install it anew bedded in mahogany 3M5200. With Christmas weekend peaking over the horizon, cleaning out the bilge and then pressure washing it will not begin until next Monday.